A cart discount applies to a cart’s products or other aspects of the cart like shipping fees. Free shipping discounts, or free shipping over a certain cart amount. Seasonal sales for a group of products. Membership or customer group discounts. Free gift with purchase discounts. “Buy one get one” discounts. Numeric: applies a relative or absolute value discount to a cart. Gift line item: adds a specific product to the cart. Cart discounts apply after adding a product to the cart, and are applied in order of their Rank (sortOrder) value. 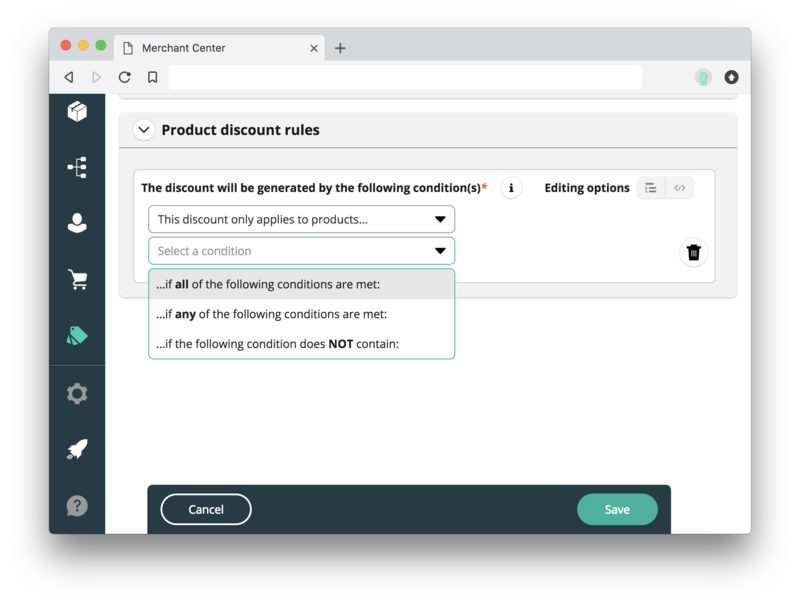 Cart discounts can also set an Do not apply any further cart discounts after this one option, which stops the commercetools platform from applying any discounts that rank lower than the one with the option activated. The number of active cart discounts for one discount code is currently limited to 10. The number of active cart discounts that do not require a discount code is limited to 100. In the Merchant Center’s main menu, navigate to Discounts > Add discount, and click Add cart discount. Select Numeric in the Cart discount type field. Cart discount name (Required): the display name for the cart discount. Cart discount description: a plain-text description of the discount. Do not apply any further cart discounts after this one: Check if you do not want discounts ranked lower than this one to apply. Valid from: the date from which the discount is valid to apply to a cart. Valid until: the date from which the discount is invalid to apply to a cart. Discount code: whether a discount code is required or not. In the Cart Discount rules section, configure the conditional statements. See Configuring a cart discount rule for more information. 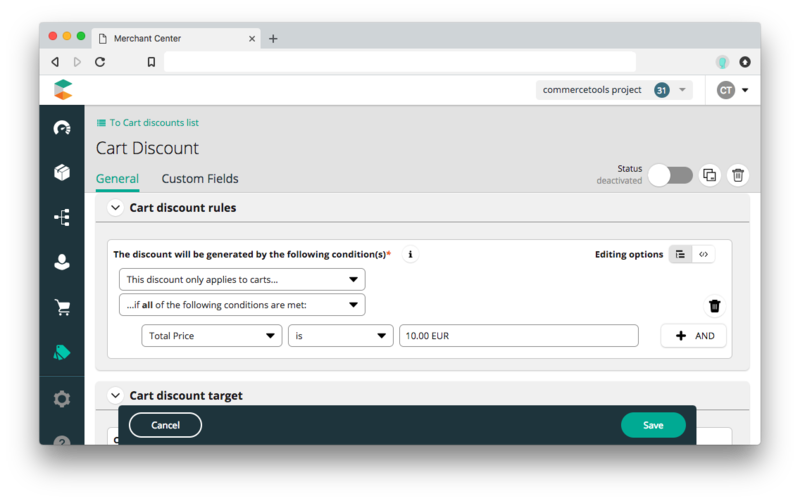 In the Cart discount target section, configure the conditional statements. 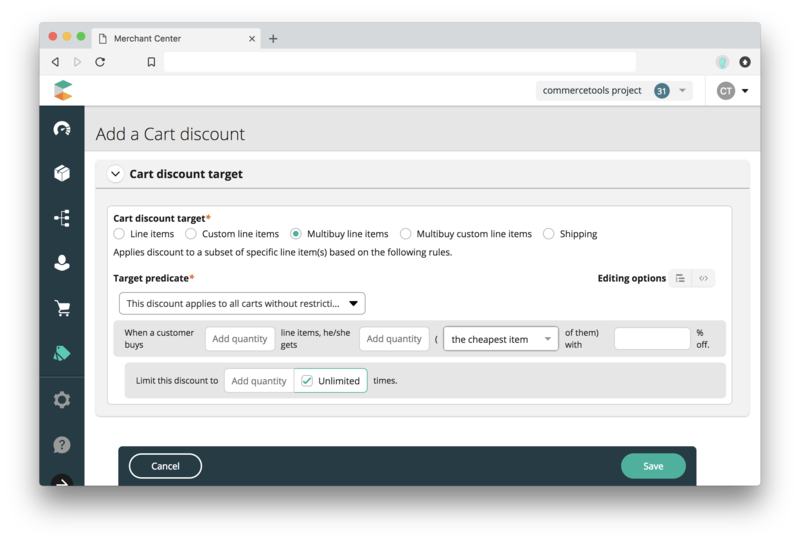 See Configuring a cart discount target for more information. Select Gift line item in the Cart discount type field. Product id (Required): The Product ID of the gift line item. You can find this in the Product’s Merchant Center URL. Variant id (Required): The Product Variant ID of the gift line item. You can find this by navigating to a specific product and clicking the Variants tab. Supply channel: The supply channel of the product. Distribution channel: The distribution channel of the product. - Rank (sortOrder) (Required): the relative importance of the discount as a decimal value from 0 to 1. A larger value ranks higher. - Do not apply any further cart discounts after this one: Check if you do not want discounts ranked lower than this one to apply. - Valid from: the date from which the discount is valid to apply to a cart. - Valid until: the date from which the discount is invalid to apply to a cart. - Discount code: whether a discount code is required or not. In the Cart Discount rules section, configure the conditional statements. See Configuring cart discount rules for more information. Configure the Cart discount rule, which defines which carts to apply the discount to. Configure the Cart discount target, which defines what kind of discount to apply. If you select This discount only applies to carts… in the cart discount rule builder, you can create a rule which applies a cart discount to the cart or products in it. A predicate, which identifies data in the commercetools platform associated with a cart. (Optionally) define subgroups for a rule or additional rules using the AND or OR buttons if available. a. Select Add subgroup for this rule and fill in the input fields as required to create a sub-group (nested) rule. b. Select Add new rule and fill in the input fields as required to create a non-nested additional rule. Line items: applies the discount to the price of line items in the cart. Custom line items: applies the discount to the price of custom line items in the cart. Multibuy line items: applies the discount when a customer purchases a certain quantity of line items. Used for “Buy one get one” discounts. For more information, see Configuring multibuy discounts. Multibuy custom line items: applies the discount when a customer purchases a certain quantity of custom line items. Used for “Buy one get one” discounts. For more information, see Configuring multibuy discounts. Shipping: applies the discount to the cart’s shipping cost. 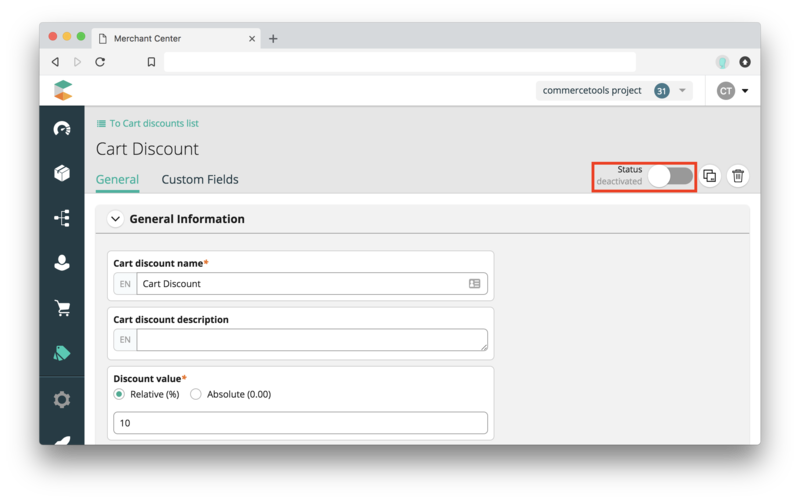 To configure Line items, Custom line items, and Shipping, see Defining a rule. To configure Multibuy line items and Multibuy custom line items, see Configuring multibuy discount targets. Mutlibuy line items apply a discount when the customer purchases a certain quantity of line items. Multibuy line item discounts are useful for “Buy one get one” promotions. Select a condition option. For more information, see Selecting a condition option. When a customer buys: the total line items (quantity) a customer must buy before the applying the discount. The most expensive item - … % off: automatically populated from on the discount value provided when creating a cart discount. - Limit this discount to: limits how many times the discount can be applied. You can either provide a value in the Add quantity field, or check the Unlimited checkbox. You can duplicate an existing cart discount to save time when setting up a new cart discount.